Before planting peas, you need to make sure the soil is tilled down to a depth of 6 inches. Pea plants do well in loose and airy soil that drains well. If you have more compact, clay-like soil, you can add compost or other organic matter to help with drainage. Peas need 6-8 hours of direct sunlight everyday, so make sure to choose an appropriate location. 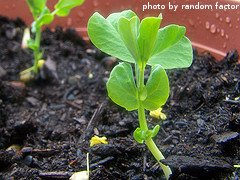 Pea seeds are best sowed directly in the garden. Seedlings don't transplant well because they don't like it when their root system is disturbed. Peas grow best in cooler weather. They can be planted early in the spring and late in the summer, depending on your climate. Peas will germinate in about a week if the soil temperature is around 60 degrees F. They will take about a month to germinate when soil temperatures are around 40 degrees F. If soil temperatures are cooler than 40 degrees, wait until it warms up before planting peas. Before actually planting pea seeds, you'll need to have some sort of support structure in place. Lots of folks plant peas under an existing fence or trellis. This works great if you have them. If not, you'll need to improvise. Pea plants are vines that need to grow vertically for maximum production. Fortunately, the pods are light, so the vines don't need a heavy duty support. They just need a little help staying off the ground. Tomato cages work well as a support structure. You can even stick a a bunch of small tree branches in the ground to support your peas. The main thing is to make sure the support structure is 3-6 feet high, depending on the variety of pea you want to grow. 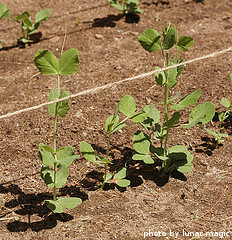 An easy method is to sink fence posts into the ground on each end of your garden where you want to grow peas. String some twine between the posts at different height intervals. Put one strand of twine 6 inches off the ground. Add the next one 12 inches high and so on until the highest one is 3-6 feet off the ground. 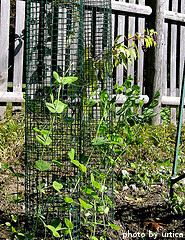 You can also put up a temporary wire mesh fence where you want to plant peas. 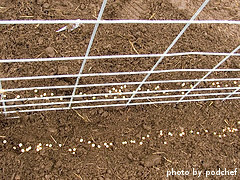 A benefit of using fencing or twine is that two rows of peas can use the same support structure, with one row on each side of the fence. Once your support structure is in place, you can go about planting pea seeds. If you are planting peas in the spring, they should be planted about a month before the last expected frost in your area. Use a hoe and create 2 rows, one on each side of your support structure. The row should be about 1 inch deep. Scatter the seeds at the bottom of the row. Use 4-6 seeds for every foot of row that you are planting. It's not important for the seeds to be evenly spaced, they will still grow fine. If you are planting multiple rows, allow 3 feet of space between each double row. After planting pea seeds, cover them with 1 inch of loose soil. Then, water them in thoroughly. If you want a fall crop of peas, you'll need to plant them in the late summer. The trick to a fall pea crop is to make sure you've harvested all of the pea pods before the first hard frost of the year. However, remember, peas are a cool season crop and don't do well in hot weather. Check the label of the seed packet to see how many days the variety of peas you choose will take to mature. Count backwards on a calendar from your first expected frost date in the fall to determine when to plant them. For best results, it's wise to choose a variety of pea that matures quickly. The only difference in planting spring peas and fall peas is the depth that the seeds are planted. When planting a fall crop of peas, plant them 2 inches deep. Since the soil temperatures will be warm, they will germinate in about a week. The extra inch they will need to grow before breaking the surface of the soil will buy you some time before the ideal cooler weather sets in. If you want to plant peas in a container, make sure the container has adequate drainage. You'll need something that is at least 8 inches deep. The diameter of the container will dictate how many pea plants you can grow. Use a good quality topsoil or potting mix to fill the container. Again, before planting peas, make sure you have a support structure in place. A tomato or pepper cage will work just fine. Plant the pea seeds next to or under the support structure. Instead of creating a row, just poke the seeds about an inch into the soil. Space them about 2 inches apart, cover with loose soil and water them in well. Now that you've planted peas in your garden, it's time to think about fertilizing and watering them.